Happy Easter Sunday, everyone! I hope your Easter is filled with family and chocolate: the two most important things about Easter for most of us who aren’t religious! I haven’t written a goals post since Christmas time and I really do think they help me to stay motivated. It’s a way of keeping myself on track and holding myself accountable basically! 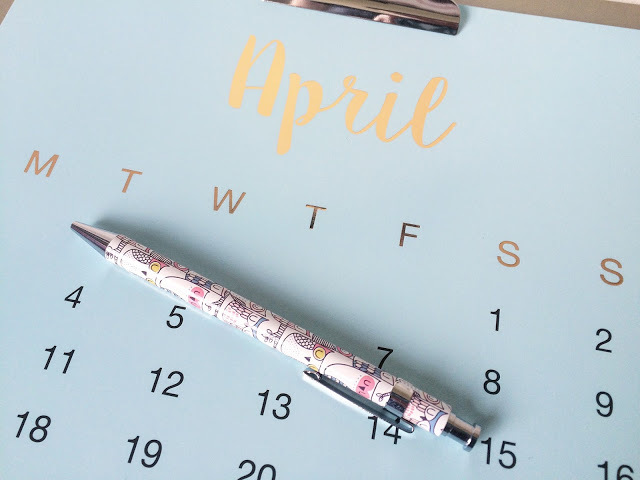 April is a busy month for myself: I have exams, assignments, a new job, new freelance work, a blog to run, theatre shows to attend, events to go to. Packing it all in is going to be a tough task but I like to keep myself busy! 1. Stick with my fitness plan and work out a minimum of five days a week. I know I will have days when I can’t be bothered but I really need to start moving more. I also want to use rest days to still be active: cleaning, walking, dance party! Tracking my fitness and food this month should help me to stay on track. 2. Blog consistently. I’d love to blog daily but that isn’t going to happen for this month. 2-3 times a week will be a great start! I’m planning on mixing up my content as well as I’ve found myself reading a larger variety of posts/topics now rather than just bog-standard beauty ones! I still love product reviews and hauls but I want to switch it up a little! 3. Start and finish one book. I planned on reading a tonne of books this year but once you start reading textbooks, you soon lose your passion for reading all over again! I adore fiction so reading those should restore my love! 4. Get organised with university. I have two assignments due in within the next month and two exams. As soon as I get my work shifts, the plan is to make sure I’m revising every day and at least fitting in a few words of my assignments every day also! 5. Go on a spending ban. My rent is due at the start of April and my student finance isn’t due in until the end of the month. I’m having to borrow a large sum of money off my parents to pay back when my loan comes in. This means this month I have very limited finances. I’ll be paying for food and travel and that’s about it. No beauty hauls, no takeaway hot chocolates, no Primark trips! 6. Keep up with my freelance work and explore more options. Now uni is coming to an end, I need to start making a move into my journalism career. I’ve just got a new retail job back at the Post Office and there may be a possibility for full time hours when I’m ready. However, it’s not a job I plan on staying in forever so finding more writing work is definitely on my to-do list. What are your plans for April? Anything exciting or just a general admin-type month for you? Leave me a comment with your plans below!